Huntkey is introducing the SZN Series of Universal Power Strips with child protection and dual USBs. There is no doubt that curious children are the sources of happiness in family, yet they might turn into the trouble-makers sometimes in daily life: electrical plugs, outlets, switches. Children are interested in touching and playing with the equipment on floor, which may do harm to their little hands. How to keep your beloved babies far away from those incredible dangers? With the child-protective design, Huntkey’s SZN smart power strip series ensure your children receive the best safe care. Besides the thoughtful design, the most attractive advantage of Huntkey power strip is that all the Huntkey products are produced under a strict quality management system. The certifications include VDE, STQC, BS, CSA, so the quality of Huntkey SZN power strip has been proved by tests in different markets. For those fans of mobile products, the Huntkey SZN507 smart power strip has also double smart USB ports, suitable for cell phones, MP3, PDA, digital cameras and other digital products. When you and your lover are enjoying your free time with babies in your arms before the TV, and find your mobile phones or tablet PC going out of power, it is annoying. 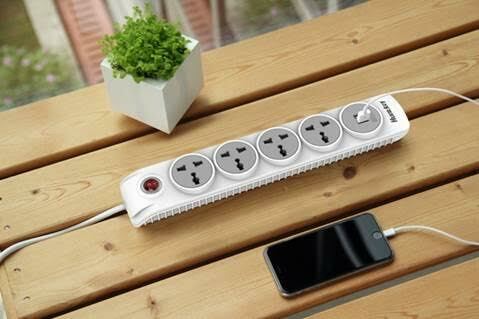 But with Huntkey power strips at home, you don’t need to look around for the mobile charger any more. You could get the USB port to charge your mobile phones conveniently and would never miss any important call or email.